The Heim ins Reich (German pronunciation: [ˈhaɪm ɪns ˈʁaɪç]; German; "Homewards into the Empire" or "Back to the Reich"), was a foreign policy pursued by Adolf Hitler beginning in 1938. 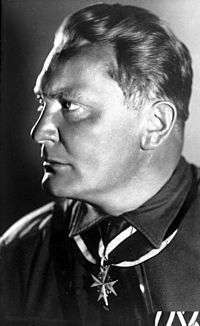 The aim of Hitler's initiative was to convince all Volksdeutsche (ethnic Germans) who were living outside of Nazi Germany (e.g. in Austria and the western districts of Poland) that they should strive to bring these regions "home" into Greater Germany. It included areas ceded after the Treaty of Versailles, as well as other areas containing significant German populations such as the Sudetenland. 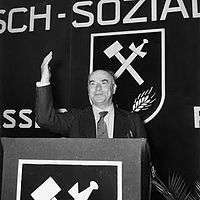 The policy was managed by VOMI (Hauptamt Volksdeutsche Mittelstelle or "Main Welfare Office for Ethnic Germans"). As a state agency of the NSDAP, it handled all Volksdeutsche issues. By 1941, the VOMI was under the control of the SS. Exhibition "Planung und Aufbau im Osten" with numbers of German colonists in occupied Poland between 1939-1941. Prior to the Anschluss, a powerful transmitter in Munich bombarded Austria with propaganda of what Hitler had already done for Germany, and what he could do for his native home country Austria. The annexation of Austria was presented as "enter[ing] German land as representatives of a general German will to unity, to establish brotherhood with the German people and soldiers there." Similarly, the last chapter of Eugen Hadamovsky's World History on the March glorifies Hitler's obtaining Memel from Lithuania as "the latest stage in the progress of history". Concurrent with this were the beginnings of attempts to ethnically cleanse non-Germans both from Germany and from the areas intended to be part of a "Greater Germany". Alternately, Hitler also made attempts to Germanize those who were considered ethnically or racially close enough to Germans to be "worth keeping" as part of a future German nation, such as the population of Luxembourg (officially, Germany considered these populations to actually be German, but not part of the Greater German Reich, and were thus the targets of propaganda promoting this view in order to integrate them). These attempts were largely unpopular with the targets of the Germanization, and the citizens of Luxembourg voted in a 1941 referendum up to 97% against becoming citizens of Nazi Germany. 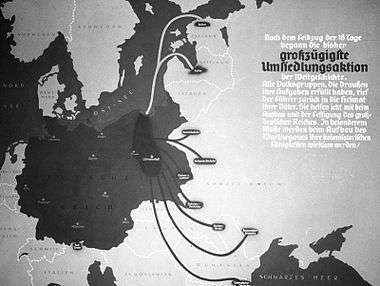 Propaganda was also directed to Germans outside Nazi Germany to return as regions, or as individuals from other regions. Hitler hoped to make full use of the "German Diaspora." As part of an effort to lure ethnic Germans back to Germany, folksy Heimatbriefe or "letters from the homeland" were sent to German immigrants to the United States. The reaction to these was on the whole negative, particularly as they picked up. Goebbels also hoped to use German-Americans to keep America neutral during the war, but this actually produced great hostility to Nazi propagandists. Newspapers in occupied Ukraine printed articles about antecedents of German rule over Ukraine, such as Catherine the Great and the Goths. Heim ins Reich in Nazi terminology and propaganda also referred to former territories of the Holy Roman Empire. 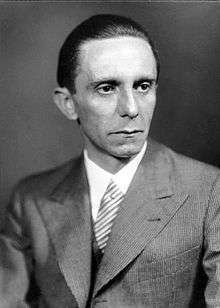 Joseph Goebbels described in his diary that Belgium and the Netherlands were Heim im Reich in 1940. Belgium was supposedly lost to France by the Austrian Empire in 1794 and the Netherlands from the Holy Roman Empire in 1648 at the Peace of Westphalia. The policy for German Expansion was planned in Generalplan Ost to continue further eastwards into Poland, the Baltic states and the Soviet Union, thus creating a Greater Germany from the North Sea to the Urals. Poles expelled in 1939 from Reichsgau Wartheland. 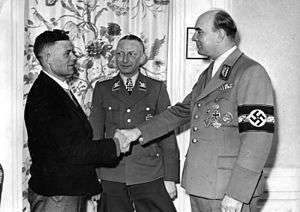 Arthur Greiser welcoming the millionth Volksdeutscher resettled from the East Europe to occupied Poland - March 1944. In the Greater Poland (Wielkopolska) region (joined together with the Łódź district and dubbed "Wartheland" by the Germans), the Nazis' goal was the complete "Germanization", or political, cultural, social, and economic assimilation of the territory into the German Reich. In pursuit of this goal, the installed bureaucracy renamed streets and cities and seized tens of thousands of Polish enterprises, from large industrial firms to small shops, without payment to the owners. This area incorporated 350,000 such "ethnic Germans" and 1.7 million Poles deemed Germanizable, including between one and two hundred thousand children who had been taken from their parents (plus about 400,000 German settlers from the "Old Reich"). They were housed in farms left vacant by expulsion of the local Poles. 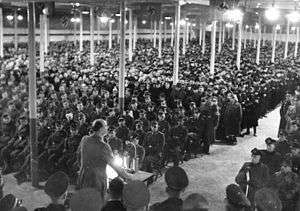 Militant party members were sent to teach them to be "true Germans". Hitler Youth and League of German Girls sent young people for "Eastern Service", which entailed (particularly for the girls) assisting in Germanization efforts. They were harassed by Polish partisans (Armia Krajowa) during the war. As Nazi Germany lost the war, they were expelled to remaining Germany. Origin of German colonisers resettled during "Heim ins Reich" action to annexed Polish territories. 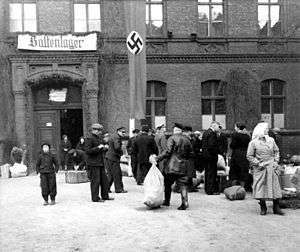 "Baltenlager" (transit camp for Baltic Germans), Posen (Poznań), 1940. 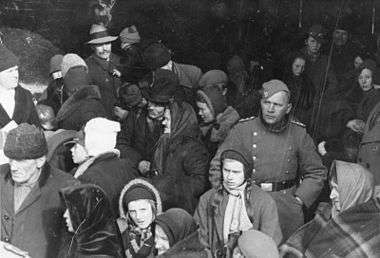 Resettled Baltic Germans take new homes in Warthegau after expulsion of the local Poles. Eberhardt cites estimates for the ethnic German influx provided by Szobak, Łuczak, and a collective report, ranging from 404,612 (Szobak) to 631,500 (Łuczak). 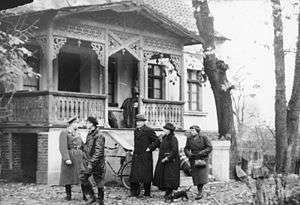 Anna Bramwell says 591,000 ethnic Germans moved into the annexed territories, and details the areas of colonists' origin as follows: 93,000 were from Bessarabia, 21,000 from Dobruja, 98,000 from Bukovina, 68,000 from Volhynia, 58,000 from Galicia, 130,000 from the Baltic states, 38,000 from eastern Poland, 72,000 from the Sudetenland, and 13,000 from Slovenia. During "Heim ins Reich" Germans were settled in the homes of expelled Poles. Additionally some 400,000 German officials, technical staff, and clerks were sent to those areas in order to administer them, according to "Atlas Ziem Polski" citing a joint Polish-German scholarly publication on the aspect of population changes during the war Eberhardt estimates that the total influx from the Altreich was about 500,000 people. Duiker and Spielvogel note that up to two million Germans had been settled in pre-war Poland by 1942. Eberhardt gives a total of two million Germans present in the area of all pre-war Poland by the end of the war, 1.3 million of whom moved in during the war, adding to a pre-war population of 700,000. Piotr Eberhardt, Political Migrations in Poland, 1939–1948, Warsaw, 2006. The increase of German population was most visible in the urban centres: in Poznań, the German population increased from ~6,000 in 1939 to 93,589 in 1944; in Łódź, from ~60,000 to 140,721; and in Inowrocław, from 956 to 10,713. In Warthegau, where most Germans were settled, the share of the German population increased from 6.6% in 1939 to 21.2% in 1943. 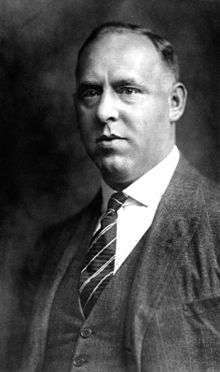 ↑ A less literal translation might be "Return to the Nation"
↑ "Hadamovsky on the Memel District (1939)"
↑ Paul Dostert, Luxemburg unter deutscher Besatzung 1940-45. Zug der Erinnerung 2015. ↑ Enzyklopadie Migration in Europa. Vom 17. Jahrhundert bis zur Gegenwart. München: K.J.Bade, 2007, ss. 1082–1083. 1 2 Eberhardt, p. 22. ↑ Eberhardt, p.26. Eberhardt refers to Polska Zachodnia..., 1961, p. 294. Wikimedia Commons has media related to Resettlement of Volksdeutsche. R.L. 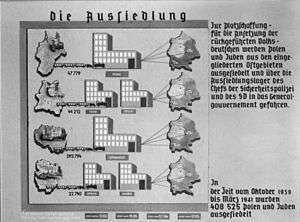 Koehl RKFDV: German Resettlement and Population Policy 1939-1945 (Cambridge MA, 1957). Anthony Komjathy and Rebecca Stockwell German Minorities and the Third Reich: Ethnic Germans of East Central Europe between the Wars (New York and London, 1980). 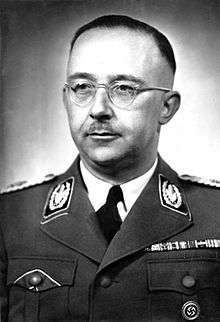 Valdis O. Lumans Himmler's Auxiliaries: The Volksdeutsche Mittelstelle and the German National Minorities of Europe, 1933-1945 (Chapel Hill NC and London, 1993).